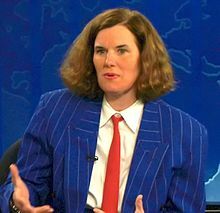 Paula Poundstone (born December 29, 1959) is an American comedian. I was one of the first people to almost actually vomit over hearing the use of the phrase "family values" and I pride myself on never having fallen for the idea that Barbara Bush was sweet and grandmotherly. I met Barbara Bush and, as I expected, she was a tank with eyes, not a nice person at all and why should that blow anybody away? "Hey Paula!". Mother Jones. March/April 1993. Retrieved on 2008-04-03. "Paula Poundstone: Look What the Cat Dragged In", Bravo channel, November 7, 2006. About science education in the state of Kansas; quoted in Randi, James (November 11, 2006). "A Sure Test". Swift. James Randi Educational Foundation. Retrieved on 2006-11-18. I don't have a bank account because I don't know my mother's maiden name and apparently that's the key to the whole thing right there. I go in every few weeks and guess. "Women of the Night", HBO, 1988.